Water is an essential ingredient to pharmaceutical manufacturing. Once purified, non-compendial water, purified water or water for injection must be stored and distributed in systems appropriately designed, installed, commissioned and validated. 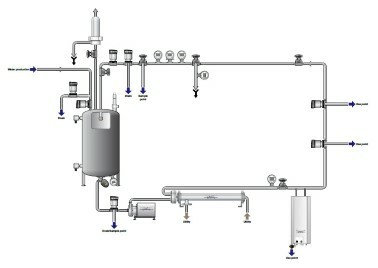 Controlling the water quality in the distribution loop to ensure delivery to the point of use at the required flow and temperature can be challenging. Which is why pharmaceutical manufacturers looking for sustainable, energy-efficient solutions to deal with, or prevent, rouging, biofilm buildup or other impurities in the water distribution loop look to Alfa Laval as a trustworthy partner. 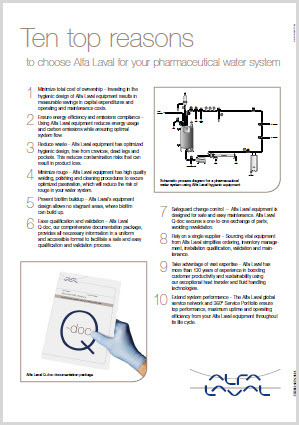 To make easy work of system and equipment validation, there’s Alfa Laval Q-doc, our cutting-edge documentation package for the pharmaceutical industry. For hassle-free qualification and validation, Q-doc encompasses every aspect of production, from raw material sourcing to the delivery of finished equipment. This provides full transparency and enables the slightest change in material or manufacture to be traced – even when it comes to spare parts.